When you’re pregnant your nutritional needs change and you will need to make sure you are eating enough for you and baby. Use these food guide pyramid serving sizes as a guide to know how much you need to eat from all of the food groups. Bread, cereal, rice and pasta. 6-11 servings (one serving = 1 slice of bread, 2 cups of rice, pasta or cooked cereal, 2 cups of potatoes or beans, or 1 oz. of ready-to-eat cereal). Use whole grains whenever possible. 3-5 servings (one serving = 1 cup of raw, 2 cups of cooked, or 3/4 cup of vegetable juice.) Use fresh whenever possible, organic is best. 2-4 servings (one serving = 1 medium-sized orange, apple or banana, 2 cups of canned fruit, 3/4 cup of juice.) Use fresh whenever possible, organic is best. 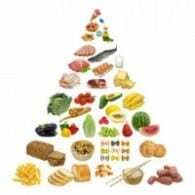 Note: The above food guide pyramid serving sizes and recommended servings apply to all healthy eaters, whether pregnant or not. The range of servings accounts for levels of exercise. Very active persons would consume the higher number of servings. Pregnant women would also consume the higher number of servings and perhaps add an extra serving to groups four and five.